This is a two pane mosaic taken with the data below to cover M78 and part of Barnards loop and then the other side of the mosaic included LDN1622 (the Bogeyman nebula) that was also enhanced by the mosaic from the larger focal length TMB. The data involved in this image then is quite significant and from two very different focal lengths...... I have plans for more of this next year!! C: QSI683 and Moravian G2-8300 with Baader RGB filters, 3nm Ha Astrodon filters and Hutech IDAS. 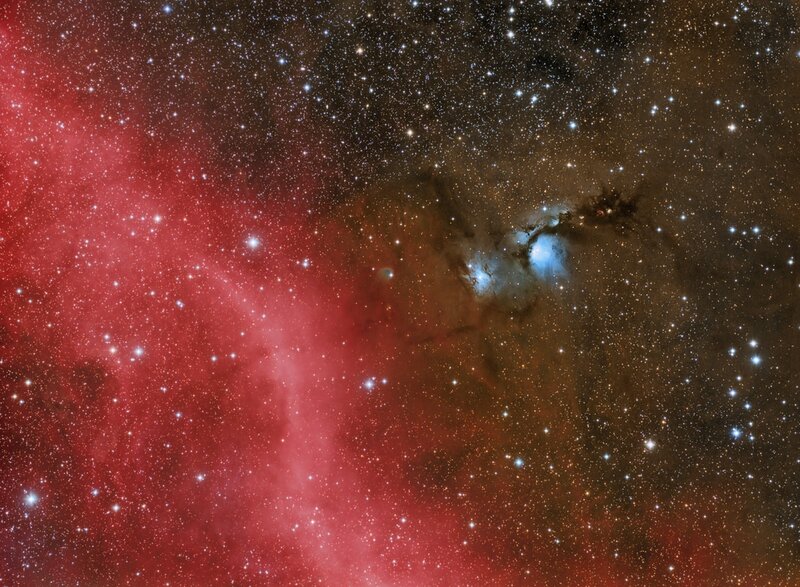 M78 is is the blue reflection nebula upper left of the frame, Barnards loop is the red area running through the centre of the frame and LDN1622 is bottom right. The nebula Messier 78 (also known as M78 or NGC 2068) is a reflection nebula in the constellation Orion. It was discovered by Pierre Méchain in 1780. M78 is the brightest diffuse reflection nebula of a group of nebulae that include NGC 2064, NGC 2067 and NGC 2071. This group belongs to the Orion Molecular Cloud Complex and is about 1,600 light years distant from Earth. ​LDN 1622 is located near the galaxy plane in the constellation of Orion. 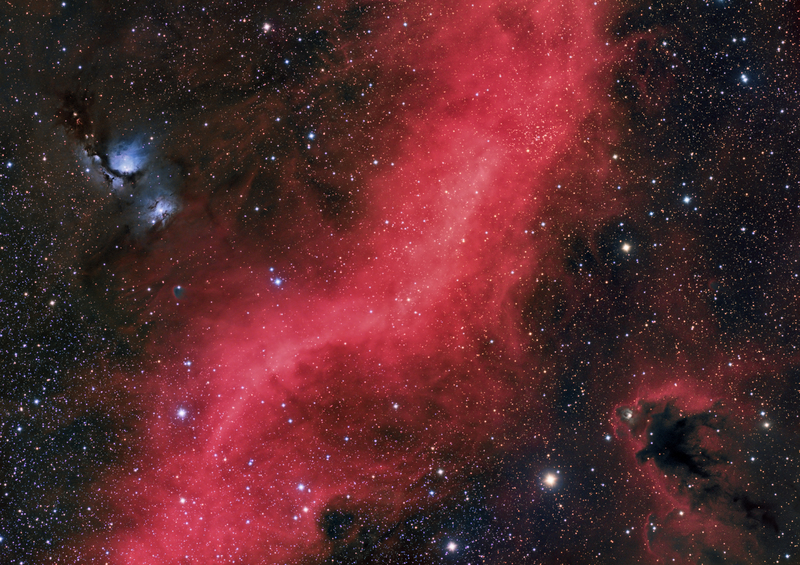 It is close to Barnards loop, a huge cloud that surrounds the emission nebulas found in the Belt and Sword of Orion. LDN 1622 is thought to be much closer to the more famous Orion Nebula, perhaps only 500 light years away. This is another image taken with the dual rig. ​Total exposure time 47 hours 30 mins. This has been blended as a simple RGB combination, then with the Ha data added into the red channel. The luminance layer was created using the luminance data and some Ha data added. You can see here that M78 is located very close the the Great Orion nebula and you can see where it is in relation to the famous constellation that is so easily recognisable.